Chattanooga has seen significant growth in the past decade. The Scenic City attracts a steady crowd of visitors and recent transplants, and with them come fresh new spots to grab food and drinks. Try a burger, local brew, or a cappuccino at one of Chattanooga’s newest establishments that have opened since the beginning of 2017. Frothy Monkey has become a cornerstone of Southside’s historic Chattanooga Choo Choo Hotel. From breakfast to brunch, lunch, and dinner, Frothy Monkey can satisfy your culinary cravings every day of the week. The 4,500-square-foot, full-service restaurant has been carefully designed to accommodate any type of diner: at the bar, at a booth or table, or at a community table. Try the farm breakfast, an assortment of sandwiches from the Royale to the Crab Cake Sandwich, or stop by for dinner: tortellini, trout, or the quesadilla. Late-night food options are available from 9 p.m. to midnight on Friday and Saturday nights. Pair your food with coffeehouse standards or craft beer, wine, and cocktails. Frothy Monkey not only offers delicious cuisine in an impeccably designed environment, but it has also become a Southside staple within the first year of business. Another recent establishment offers authentic southern cuisine just steps from the Tennessee Aquarium. Moe’s Original Bar B Que was the brainchild of three Alabama boys with a love of all things southern: BBQ, blues, college football, and whiskey. Moe’s pairs mouth-watering smoked barbecue with authentic southern-style side dishes and desserts from recipes passed down for generations. Choose irresistible options like the pulled pork sandwich meal, the smoked chicken platter, southern fried catfish, or smoked chicken wings. If you need to wash down the barbecue with a beer, stop by Jack Brown’s Beer and Burger Joint in the revitalized Tomorrow Building. Recently named the 11th best burger joint in America by Business Insider, Jack Brown’s pairs more than 100 craft beers from around the world with an award-winning selection of burgers. The Virginia-based restaurant chain specializes in burgers prepared with Wagyu beef and embraces creative variations of classic flavors. Try The Elvis, topped with peanut butter, mayo, Applewood smoked bacon, and cheese, or The Greg Brady, topped with house made mac n’ cheese and Martin’s barbecue potato chips. Sample the vast variety of burger and beer combinations any time you choose, as Jack Brown’s features a burger special every day of the week. Located at the base of Lookout Mountain, The Tap House brought 30 new beer taps to the St. Elmo neighborhood when it opened its doors. 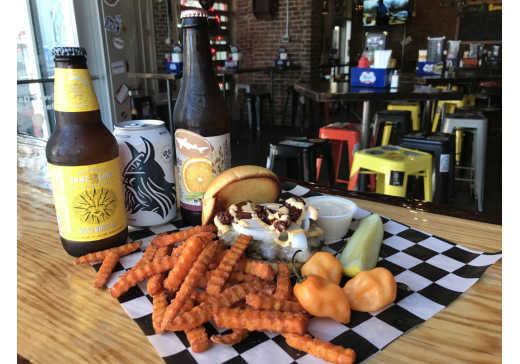 Located just down the street from 1885 Grill, The Tap House features a rotating selection of local and international beers as well as light food options such as paninis, sandwiches, hummus, and meat and cheese plates. Meet up with friends and family and bring the kids. The Tap House has a selection of board games and offers trivia on Wednesdays at 7 p.m. and Bingo on Thursdays at 7 p.m. The Chatter Box Cafe is the fruit of Brandon Ellis’ labor. A transplant from Kentucky, Brandon created Chatter Box Cafe out of a passion for food and community. The menu is constantly evolving in order to always include fresh, in-season ingredients, but rest assured that Brandon’s meals always feature meats smoked for hours on his hardwood smoker. Come to Chatter Box to enjoy brisket, ribs, chicken wings, and more—all cooked tender and seasoned to perfection. The cafe is open on Thursday, Friday, or Saturday from 11 a.m. to 7 p.m. at the corner of 19th and Market Street. You can also find its pop-up food truck around town by following them on Facebook and Instagram. As the folks at Chatter Box Cafe say, you just need to "follow the smoke." Follow your tastebuds on Chattanooga’s brand new TAPTOUR. As the name implies, this is a self-guided tour through Chattanooga’s craft beer culture. Navigate Chattanooga’s best breweries and beer drinking communities with the help of a little yellow book. This free Brew Guide is a place to record which establishments you’ve enjoyed and which are still on your list. Enjoy a local brew to receive a stamp at each participating location. Once you have 4 stamps, pick up a free pint glass at Imbibe. Collect 13 stamps and pick up a free growler and a discount on a local brewery fill. You can pick up a Brew Guide at any participating locations listed on the TAPTOUR website. It is easy to see why Chattanooga continues to attract new residents and visitors. The variety of food and drink options evolves as the city grows. Step out next weekend and enjoy one of Chattanooga’s newest hot spots for food and drink. Whether you favor burgers, barbecue, or local craft beer, you’ll find plenty of options to satisfy your cravings.